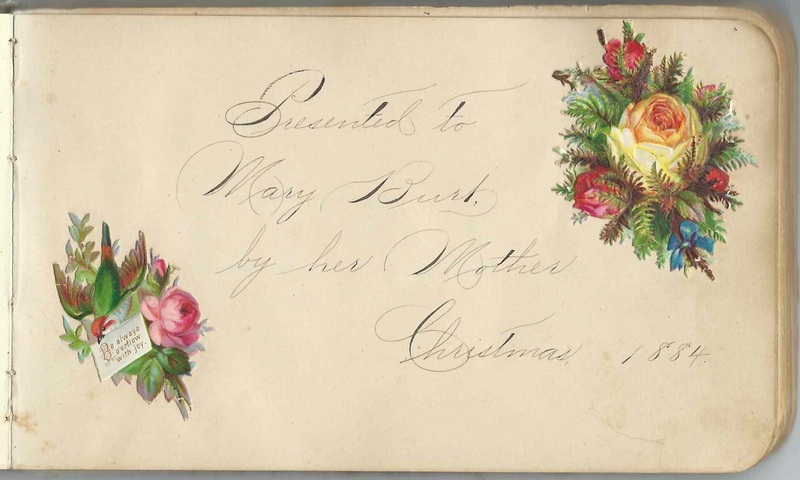 1884-1896 autograph album that was given to Mary Burt of Essex, New York, by her mother Nancy Lenora (Farr) Burt at Christmas in 1884. They may have lived in the Whallonsburg section of Essex, as several of the signers did. 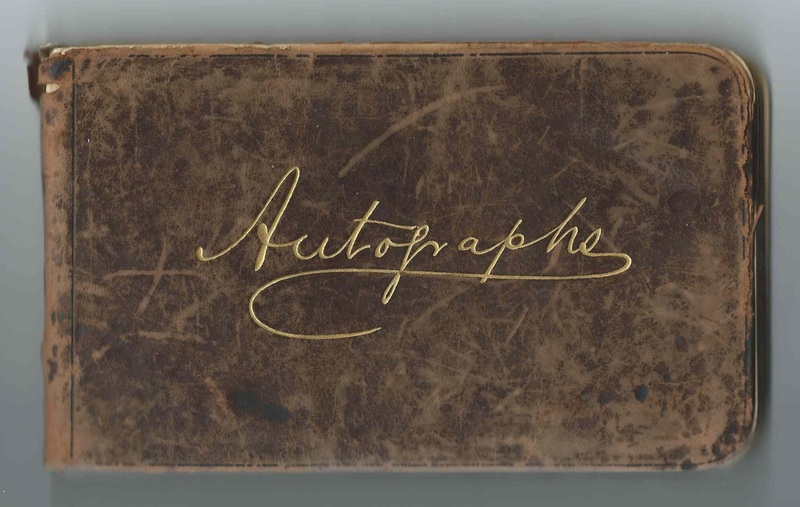 See another post that features the 1854-1886 autograph album of Mary's mother, Nancy Lenora (Farr) Burt. Among the approximately 80 signers are many members of the Farr and Burt families of New York and Vermont, along with family members who had moved to the Midwest. Be aware that there may be mistakes in the family history below. If you find a mistake or mistakes, please let me know. 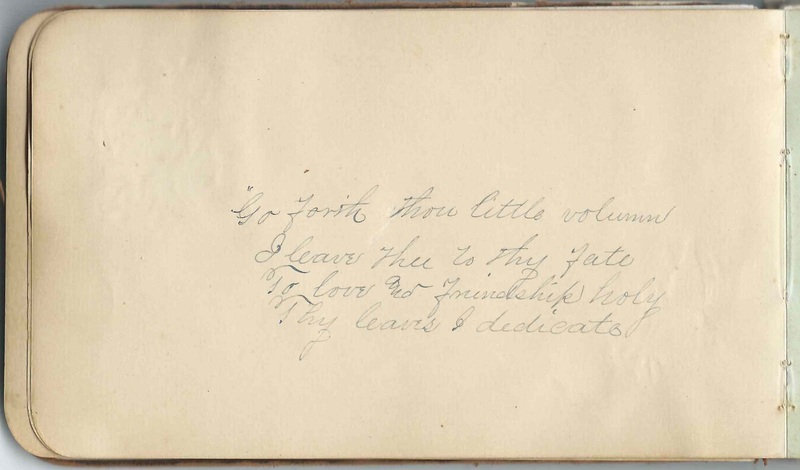 The album measures approximately 6-3/4" x 4" and contains the sentiments of about 80 of Mary's relatives and friends, a few of whom signed group pages as well as individual pages. Mary's maternal great uncle, Volney A. Farr, may have signed three pages, on one of which he signed in 1885, he gave his age as 67. Mary Burt was born March 4, 1871 at Essex, New York, the daughter of John and Nancy Lenora (Farr) Burt. Mary's mother didn't sign a page other than the presentation page, but Mary's father, John Burt, signed a page on January 10, 1886. Mary added a note: "Died March 11, 1892". One signer indicated that she was Mary's grandmother. 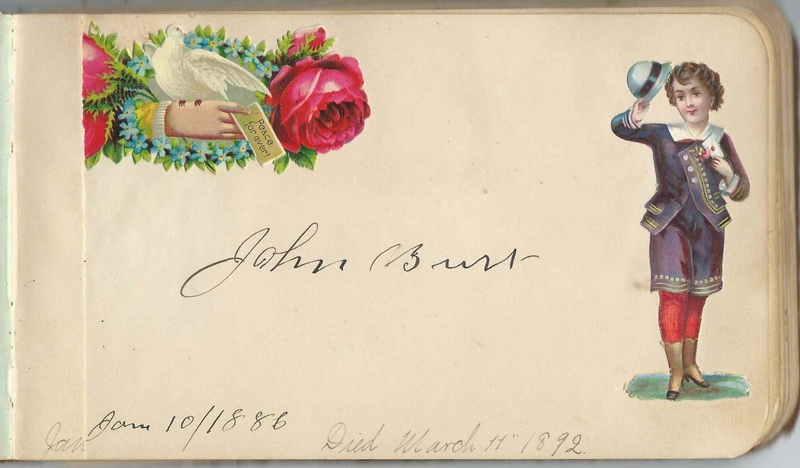 Since John Burt's mother, Susannah (Sherman) Burt had died in 1886, and the page was signed on April 1, 1890, I believe the signer was Nancy L. (Farr) Burt's mother Martha (Fales) Farr. Mary may have attended a Normal School, as three signers mentioned E.N.S. I looked for an Essex Normal School but didn't find one. The school might have been an Eastern Normal School somewhere, even in Vermont. Or it might have taken on the meaning of an "eastern normal school", which equated with an academy. On January 10, 1894, Mary Burt married Clyde R. Brown, son of Henry and Nancy (Chatterton) Brown of Whiting, Vermont. Clyde had earlier signed a page in Mary's album, on February 10, 1890. Mary and Clyde had at least one child, a son Charles. They lived at Whiting, Vermont, and Brandon, Vermont. Many other signers indicated a relationship with Mary; refer to the lists below. If you notice that I've erred in describing their relationship to Mary, please let me know. If you have corrections and/or additions, or information on any of the signers listed below, please leave a comment or contact me directly. Cora Ida Ball of North Ferrisburgh, Vermont, signed on August 29, 1889; "your loving cousin"
John Burt, signed January 10, 1886; Mary's father. Mary's note: "Died March 11, 1892"
Harry R. Church of Whiting, Vermont, signed on March 17, 1890. George V. Farr of Brandon, Vermont, signed on October 30, 1889. George Volney Farr (1841-1909), whose wife Lillian Abigail (Crooks) Farr signed the right facing page. Alternatively, this could be George Volney Farr, Jr.
Lillian A. Farr of Brandon, Vermont, signed on October 30, 1889. She was Lillian Abigail (Crooks) Farr, whose husband, George Volney Farr, or son of the same name, signed the left facing page. Martha L. Farr of Brandon, Vermont, signed on October 31, 1889; "your cousin". She was the daughter of George Volney Farr and Lillian Adelaide (Crooks) Farr. George was a brother to Mary's mother Nancy L. (Farr) Burt. Volney G. Farr of Brandon, Vermont, signed on October 31, 1889. Corporal Co. C, 1st Regt, V.N.G. He was George Volney Farr, son of George Volney Farr and Lillian Abigail (Crooks) Farr. George Sr. was a brother to Mary's mother Nancy L. (Farr) Burt. 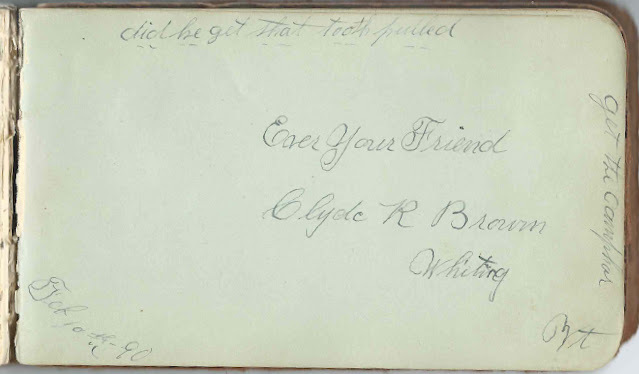 Martha L. Farr of Brandon, Vermont, signed on October 30, 1889; "your cousin"; shared the page with Carl T. Farr; Hugh Schofield; E.U.P. Carl T. Farr of Brandon, Vermont, signed on October 30, 1889; shared the page with Martha L. Farr; Hugh Schofield; E.U.P. Aunt Jannette, signed at Brandon, Vermont, on November 10, 1889. Presumably Mary's mother's sister Janette Farr. "Your loving Grand Mother, signed on April 1, 1890. I believe the signer was Martha (Fales) Farr, as Mary's other grandmother, Susannah (Sherman) Burt, died in 1886. Martha (Fales) Farr, wife of Thomas Gibbs Farr, lived until 1907. V. A. Farr, signed on September 16, 1891; not sure of first initial. Possibly Volney A. Farr. Uncle Volney of Springfield, Ohio, signed on August 11, 1885; "67 yrs". Presumably Volney A. Farr, brother of Mary's maternal grandfather Thomas Gibbs Farr. V. A. Farr, signed on September 7, 1891; presumably another page signed by Volney A. Farr, brother of Mary's maternal grandfather Thomas Gibbs Farr. Volney died in 1892. J. Burt Fisher of Essex, New York, signed on November 28, 1895; your nephew. He was John Burt Fisher, born October 15, 1883, son of William O. Fisher and Frances (Burt) Fisher, "Fanny". Fanny was Mary's sister. Mrs. Helen Fisher Blinn of Antigo, Wisconsin, signed on February 16, 1885. Wife of William H. Blinn. F. Spencer Hamer of Champaign Co., Illinois, "Born July 12, 1852"
Mrs. C. N. Hieder, signed on October 22, 1896. "Just as a breath from the prairies I come". William Norman Irish, Rector of St. John's Church, Essex, New York, signed during Easter Week in 1885. His wife Emma Juliet (Lewin) Irish signed the overleaf. Emma J. Irish of Essex, New York, signed in April 1885. She was Emma J. (Lewin) Irish, wife of Rector William Norman Irish, who signed the overleaf. Allie A. Kelsey, signed on February 28, 1890. She attached a spray of wheat and ribbon, in keeping with her sentiment: "May our friendship not be as the chaff, Which is recognized only to be cast away, But as the golden wheat, which is useful. And the Crystalized grass which is beautiful." John R. Mather, signed at Whallonsburgh, New York, on January 21, 1885. Perhaps John Royce Mather - if so, the Mrs. J. R. Mather who signed the facing page would be Amy Safrona (Brasted) Mather. Mrs. J. R. Mather, signed on January 20, 1885. If her husband, who signed the left facing page as John R. Mather, was John Royce Mather, then she was Amy Safrona (Brasted) Mather. N. E. Mather of Whallonsburgh, New York, signed on February 10, 1885. Possibly Nelson E. Mather of Essex, New York. F. N. Newell, signed on "11th - 10th - 1889"
Martha A. Oliver of 153 South Union Street, Burlington, Vermont. Mrs. ? 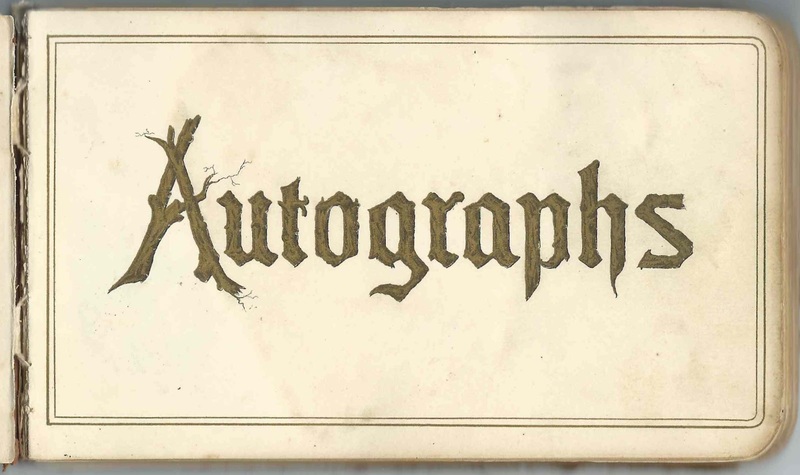 A. Palmer, signed at Whallonsburg, in Essex, New York, on February 18, 1885. First initial might be I or J or ? J. C. Ransom of Whiting, Vermont, signed on December 31, 1889. Joshua Corson Ransom, whose wife Mary H. (Lowell) Ransom signed the right facing page. Mary H. Ransom of Whiting, Vermont, signed on January 1, 1890. She was Mary H. (Lowell) Ransom, whose husband Joshua Corson Ransom signed the left facing page. Hugh Schofield of Greenwood, Wisconsin; shared the page with Martha L. Farr; Carl T. Farr; E.U.P. A. P. Trout of Springfield, Ohio, signed on June 20, 1886. Aaron P. Trout, who shared the page with his wife Mabel Dean (Farr) Trout. Mrs. A. P. Trout, signed on August 16, 1892; your cousin. She was Mabel Dean (Farr) Trout, daughter of Volney A. Farr; shared the page with her husband Aaron P. Trout, a brother or cousin of Mary's mother Nancy L. (Farr) Burt. Cora J. Tucker, signed at E.N.S. on October 7, 1885; presumably a normal school. Marcia A. Webb of Chippewa Falls, Wisconsin, signed on August 15, 1887. She was Marcia Ann (Fales) Webb, wife of English immigrant Francis C. Webb, and younger sister of Mary's mother, Martha (Fales) Farr. Kate M. H. Webster, signed on January 15, 1893. Note: "Mother of Christine A. Eastman" Presumably Kate Mary (Hubbard) Webster, wife of Luther Allison Webster. They were the parents of Christine Jane (Webster) Eastman, wife of Irving Willard Eastman. Annie Williams of Whiting, Vermont, signed on March 2, 1890. Note: "Robb Woods' Mother, Brandon". Annie Williams married Frank J. Wood in 1895. D. E. Winslow of Whallonsburgh, New York. 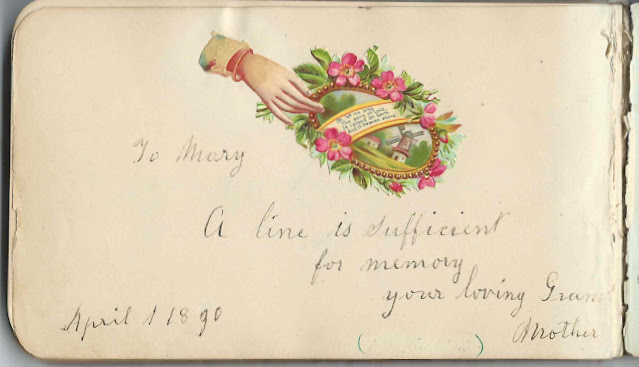 Mary's note: "Died Mar 19 1887". Dean Edson Winslow.